The purpose of this thesis was to benchmark and compare different representations of sparse matrices and algorithms for multiplying them with a vector. Also, to see the performance differences of running the algorithms on a CPU and GPU(s). Four different storage formats were tested – full matrix storage, coordinate storage (COO), ELLPACK (ELL), compressed sparse row (CSR) and compressed diagonal storage (CDS). Performance tests were run on a desktop computer and also on EENet (the Estonian Education and Research Network) worknodes. The EENet worknodes added the opportunity for dividing the workload between their two GPUs. Using OpenCL gave a speedup of 3,6 times over pure C++ code when using the full storage method and basic algorithm. With more complex storage formats, the speed gain was even more distinct. Converting the vectors into images did not give the expected speedup on most cases. Still, it performed slightly better on the nVidia hardware. An option would be to create both kinds on kernels in a situation like this – one with image support, another with normal memory access, and see which one performs better. The conversion into textures requires only slight modifications of the kernel and host-code. 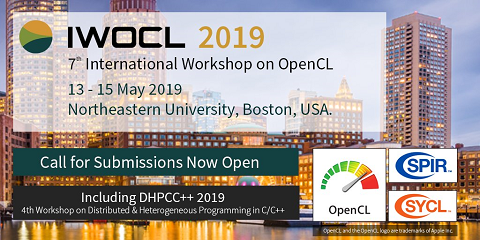 The problem with using OpenCl is the need to effectively parallelize the original task and use as much of the available computing power as possible. As the results show, the performance is highly dependent on the type of matrix and hardware used. For an all-round choice the CSR seems to be the best, being the fastest in all tests. This may of course change with the selection of new matrices and further optimization of kernels. The performance benefit when using multiple devices also depends on the type of matrices used – with smaller ones, the additional overhead of creating a new command queue and kernel execution can nullify the advantage of more processing power. With larger matrices, speed ups of up to 60% were noted.